In the 3rd grand test of the famous Martingale system we will remove the limit of the maximum bet. Only very big casinos can afford unlimited bets. If we had enough capital, then in theory, we would be able to double our bets almost infinitely. A practical issue remains how much would be bearable for our wallet and psychics. Is the balance going to be positive after 100,000 Roulette spins in this test? On the page devoted to the Martingale system we stated that doubling-of-the-bets strategy after a lost spin in Roulette could be very risky and tricky mainly due to the limit of the maximum bet, which would not enable us to double the bets in full in case of long losing series. At the same time we admitted that providing we had an unlimited capital and a casino allowed us to bet as much as (no limit) and as long as we needed, then we would probably break any-long losing series and eventually profited. Will 100,000 spins in this test be enough to prove that? In order to be able to draw a comparison we used the same numbers – the same 100,000 randomly generated consecutive numbers – as in the previous two tests of the Martingale system. In the first test the limits were $5.00 min and $500.00 max (could be applied to some stone casinos) and in the second test we operated with "micro bets" – we decreased the minimum bet to $0.10 (could be applied to some internet casinos for instance) and the maximum limits were tested on three levels $50.00, $100.00 and $500.00 in order to find out the influence of the room for doubling of the bets. The background of the test is the same as in the previous two tests. Let us briefly recapitulate the settings and conditions of the test. No limit Martingale is tested by means of a random simulation in MS Excel (however in this test new numbers were not generated, but we used the same numbers as in previous tests so we can compare various limits or no limits). We play French Roulette (single zero) and always bet on the red color, as we know that it does not matter (from probability point of view), which color we pick or whether we alternate them or not. Black numbers and zero(s) lose instantly. The minimum bet is $5.00, no limit for the maximum bet. The first 20 spins of the simulation is, for illustration, given in the Table 1. The Profit or Loss is a netto outcome of the spin, cumulated in the Balance. "Running" balance is the most significant indicator of the test. The initial balance is zero. Theoretically we have got an unlimited amount of chips so we can double any bet in case we lose a spin. We are interested in both development of the balance in time (spins) and its final value after 100,000 spins. The chart below is the best way to display the development of the balance. Traditionally the axis x represents spins 1 to 100,000. 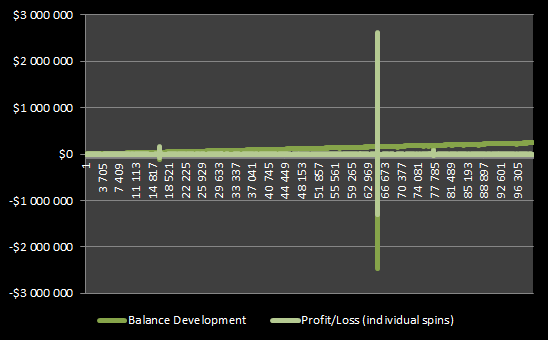 The balance and the profits/losses in individual spins are shown on the vertical axis y. We can see that the spread of the balance has enlarged – the interval is -$3 to +3$ million. It gives us an idea how far can doubling of the initial $5 bet can go! By the first look at the chart we can see that we finally ended up in the positive territory after 100,000 Roulette spins. The exact figures are given by the Table 2. The outcome of the test is that we would win almost $250,000 out of zero, more precisely $242,990. It does not differ a lot from the best positive balance achieved in this test of the Martingale system with no limits. Balance trend is a key indicator. With some exceptions the trend is steadily growing. It means that we always managed to overcome losing series – no matter how long they were – by doubling of the bets. Even though we can notice that at the worst moment of the test we would be losing over $2 million, precisely $2,462,950 – and that is what most players would not be able to cope with. Therefore it is clear that a very long losing series must have occurred, which is clearly demonstrated by the slump in the chart above. As we used the same numbers as in the previous tests, even here the worst series took 19 consecutive spins, but since there is no limit, its consequences are quite different. The column "1 in ..." shows the probability of the series. The longest losing series – of either black numbers or zeros in a row – is shown by the Table 3. For a better idea of the impact on the balance we included one spin before and one spin after. We can clearly see how far the initial $5 bet can go. Even in the last yet unsuccessful spin (No. 65,219), when a zero came up, we had to double our previous bet to $1,310,720 and lost it! 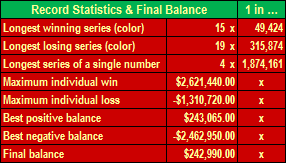 So far it would cost us incredible $2,621,435 and our balance would fall from +$158,485 to -$2,462,950. But we managed to overcome the worst losing series only because (1) we were allowed to double our bets at will (no limit) and (2) we could afford that financially (we assumed to have an unlimited capital). 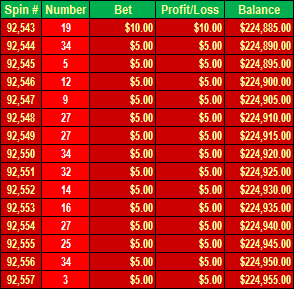 Table 4 presents the progress of the doubling of the minimum $5 bet up to the double No. 30. Consider it yourself. The longest winning series is not interesting as its losing "colleague". It took 15 spins, thus it was shorter, especially because the losing series include zeros as well. Even though it is good to mention it for another reason. It shows how much winning series can earn. The balance grows by the initial bet ($5) only. As any time we win, the series ends and we go back to the initial (minimum) bet. The bets are doubled only in case of a lost spin. 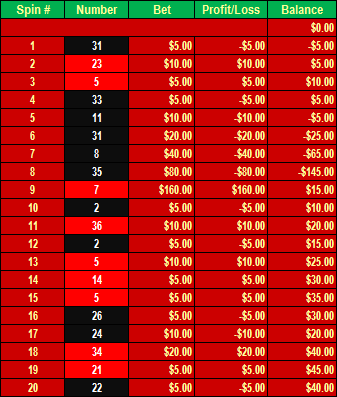 We can see that when the first number in order of this winning series appeared – 19, red – the bet made $10.00. It means that the previous spin was lost and we had to double the bet. On the basis of the carried out test we can say that the Martingale system is theoretically an invincible strategy in Roulette – with great emphasis on the word "theoretically". The article shall not raise false hopes as it will be further explained and due to the house edge is ever-present. No matter how long a losing series can be, we can always overcome it at some stage by doubling of the previous bet. That not only covers the losses, but the sub-balance from this series turns into the positive territory. 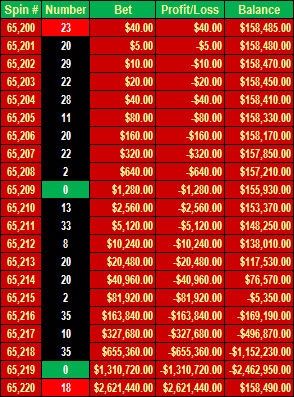 Since the Martingale system with unlimited bets was simulated via MS Excel, it was possible to repeat it numerously. We find it interesting that in all cases – with the minimum $5 bet – the test finished with the net profit of approx. $240,000, even though the course of the balance could differ, e.g. by more frequent slumps to the negative balance. Sometimes the slumps were absurdly deep, especially when the losing series took more than 20 consequent spins. It would be a great deal of bad luck if the final balance was negative – that would have to happen right before the end of the test. Practically one cannot count on the "invincibility" of the Martingale strategy for the well-known reasons. Firstly due to content of our wallet (see the Table 4 – doubling of the bets) and secondly due to maximum limit, which is applied by majority of casinos. It turned out that long series over 10 spins are not an exception, while the limit does not allow us to double in full. That was also proven by the two previous tests. The Martingale strategy might work in the practice or for some time, but it is considerably risky and tricky if we delude ourselves that we can keep winning on stable basis. The greatest risk consists in the fact that we could ruin our capital very rapidly in case of long losing series. Also if our balance dropped quite deep and we hit the top limit, the road to the surface would be very difficult and could only be secured by a dose of luck.